Titan 320 GS – Starting at $43,900 NEW! Print speeds up to 979 sq. ft. / hr. 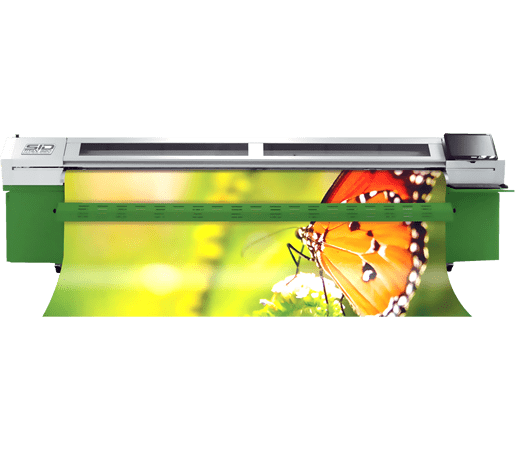 Proven durability and reliability – The TITAN Wide Format Printers have a well-established presence in the outdoor printer market and are among the most affordably priced models in their class. With very low ink costs and consumption, operating costs are kept at a minimum with ROI at a maximum. These printers are built for lasting performance with quality materials and craftsmanship. The TITAN Series printers use dependable Seiko micro piezo print head technology, ensuring brilliant prints with excellent ink adhesion, scratch resistance and outdoor durability. The Automatic Individual Positive Pressure Cleaning System guarantees worry-free maintenance, allowing the purging of print heads as needed, one-at-a-time or simultaneously – saving valuable time and ink. The pre, platen and post heating system, combined with cooling fans, allow for better ink fixation and faster drying, another valuable time-saving benefit. The redesigned SID Titan now offers a brand new reinforced heavy duty aluminum structure that holds stronger media feed bars and a reinforced cover. It also features an enclosed cabinet that can store 5 liter ink tanks securely, and a space saving shelf for a keyboard and a 19″ LCD mount for easy operations. The new Titan has been developed with an exclusively designed printer chassis that provides superior functionality, only available to the SID brand.